If you are a Mangalorean/Goan you can conjour up the best of memories when you see a plate of steaming sannas, isnt it? Picture this – a bowl of piping hot Pork Sorpotel or Pork Bafat with some steaming fresh from the tondor Sannas – Bliss! Being a Mangalorean Catholic, the deep rooted love for Sannas came naturally and even the thought of Sannas brings to my mind a sweet fragrance of fermenting rice batter that attaches itself to everything from the steam to the kitchen walls and also to those who are preparing them. Sannas used to be a grand affair when I was little. They were always made to mark some celebratory occasion – feasts, festivals and birthdays, when it was made in abundance to cater to a large number of guests who poured into our homes. My fondest memories are of my mum hurriedly pouring batter into ramekins, batch after batch and trying to finish off just in time to attend the midnight Mass on Christmas Eve. We would then return from Mass and have a second round of dinner – Sannas with Pork. Yum! I think, most Mangaloreans I know would have eaten Sannas with Dukramaas (Pork Bafat) on Christmas day – year after year. This is like the Christmas Day staple diet. When I was in Mangalore, many churches/schools, especially St. Agnes Special school used to host the ‘Christmas Tree’ celebrations or ‘Fancy Fetes’ on Christmas day or the day after (usually during the Christmas week). It was impossible not to bump into a hundred relatives, friends and those you met last year on the same date during the same fete 🙂 And it was impossible to avoid the standard question “Christmas gammath gi? Kalein special?” (Did you have a jolly good time for Christmas? What was special for lunch?) and yeah – the most standard answer would be “Sanna ani Dukramaas”. Although there would be other special items on the menu in every house, it went without saying that ‘Sannas & Pork’ were the highlight of the day. Sugar is also added to the batter before it is poured into ‘gindul (singular) /gindlaan (plural)’ (ramekins) and steamed in a steamer (tondor – similar to the dhokla maker) which gives the Sannas a sweeter taste than regular Idlis. The Sannas also score over the Idlis as you can eat Sannas for breakfast – with Chutney and/or Sambhar, for lunch & dinner as an accompaniment to Chicken/Pork/Mutton/Beef/Vegetable curries/gravies. During teatime one can savour them with a little Sweetened Roce (coconut milk) or by simply dipping them in Tea/Coffee. Leftover Sannas are also deep fried and eaten as a pakora (but I would never recommend it as the Sannas absorb a lot of oil!). Infants and toddlers often love the Sanna dipped in milk or ghee and sugar – crunchy & yummy. If you are bored with the regular Sanna, you can make sweet or savoury stuffed Sannas too! How versatile! Although Sannas were traditionally made in every Mangalorean/Goan home, it is available in bakeries today. Some housewives take regular/seasonal orders and have them home delivered. It is considered cost effective by many people including office goers and senior citizens who are in no position to dabble with the whole Sanna making process. However, Sannas taste best when they are fresh and warm – right out of the ‘tondor’! I think I should stop rambling about the Sannas and give you a chance to try them out! If you have made Idlis before, this should come easy, if not, don’t worry, there’s always a first time 🙂 – the one you wont regret! 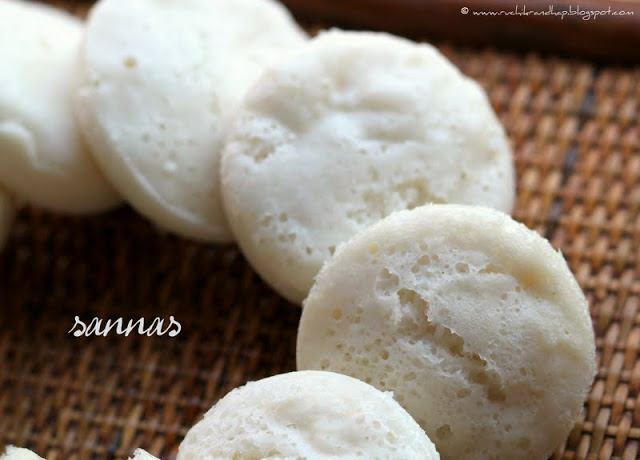 Sanna ~ Delicious, pillowy soft & mildly sweet steamed rice cakes to mop up your favourite veg or non veg curry with these for lunch or dinner or dunk them in a bowl of sambhar and relish a hearty breakfast. First grind the Urad dal to a fine paste and remove it - this helps in making the Sannas fluffy. Next, grind both types of rice together to a fine thick batter (not as coarse as Idli batter). Try to use as little water as possible to grind. It should be of dosa batter consistency but not too thick. Transfer to a wide, deep pan large enough to accomodate batter that will double during fermentation. Prepare the yeast solution by mixing the yeast and sugar in a bowl of tepid water. The sugar helps the yeast to dissolve faster. Allow to stand for 10 minutes, the yeast will ferment and turn frothy. Stir to ensure that all the yeast granules have dissolved and what you have is a thick solution. The batter would have doubled - for fluffy Sannas do not stir the batter or it will go flat. Place sufficient water in the steamer (tondor) and bring the water to a boil. Keep ramekins greased and ready. Pour batter into them half full. Place these ramekins into the steamer, cover the lid and steam for 15-20 minutes. Remove the lid carefully so as to prevent the vapour from falling on the Sannas (making the surface slightly soggy) and the steam from burning your hands/face. Carefully remove the ramekins and place them face down on a large plate. Allow to cool (to speed up this process if you need the ramekins for the second batch, place cold wet towels over them to speeden up the cooling process). Once cool, remove carefully and serve ! enjoy! 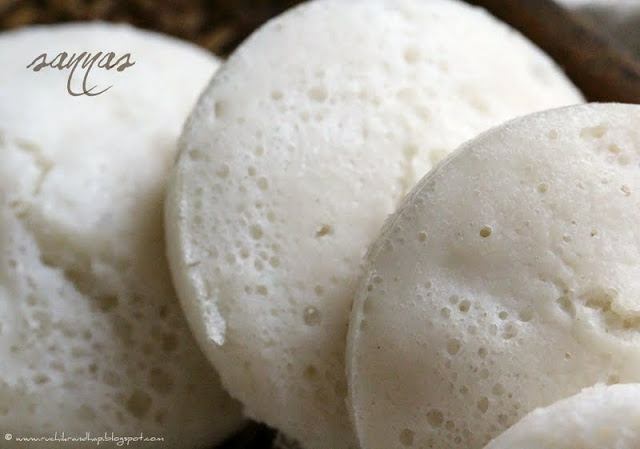 Lovely idlis…looks so spongy and soft…pearly white and I am sure it would be great with any spicy accompaniment. yes its good to ea with Chicken curry, sukka and Chick peas curry. superb soft n moist idlis..never heard abt this version..thanx for sharing! Shir I made them too twice.. Was so happy it came out nice. Love sannas. Will try this version too and let u know. 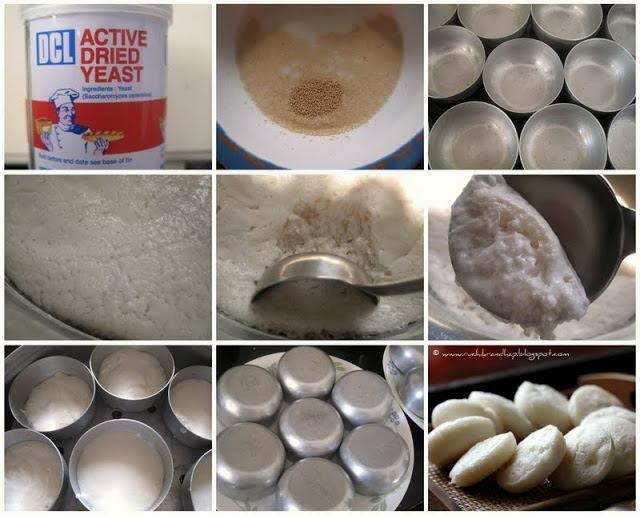 Quite a new idlis for me, adding yeast sounds interesting,cant wait to try this soon..love that cute moulds.. They look really nice n fluffy like little pillows! A great new version n a must try! They looks really soft and wow,treat for eyes too !I am sure I will enjoy making this! Thanks Priya 🙂 lemme know how they turn out! Sanna looks delicious.Can we substitute yeast with baking powder. Thanks Shireen for your wonderful explanation of using baking soda instead of yeast. Somehow i could get Fleischmann's Yeast Active Dry Yeast From Walmart(I live in USA).I will give a try . The Combination of dukramaas with sanna is so tempting. Thanks for the Sanna recipes. one of my favourites. Tried making this recipie today and ran into some trouble. After making the batter and allowing it to rise well for around 4 hours, I started to steam the sannas. For some reason the batter will not steam and solidify but tends to boil over. I first thought my steamer had too much water and reduced it but this was not the case. The batter ended up like a goey mixture in the cups. Please help… really inspired by your other recipes and was hoping to eat some delicious sannas! Also, what is the purose of using the "1 fistful Urad dal (Split Black Gram Dal)?" I have another questions. Can I use regular asian jasmine rice on this recipe? I from USA and where I live, not sure where I can find the "boiled rice' [Idli Rice]. Are you in the bay area? If so, you can find boiled rice at New India Bazaar on El Camino Real, Santa Clara. Stores that sell products from Kerala usually carry it too. Hi Christy, ideally you need to use all the ingredients mentioned, but you may skip the Urad Dal which can be found in Indian stores by the name of White Black Gram Dal. But I know people who have lentil allergies who skip them while making Sannas. Urad dal is used to aid fermentation of the batter and ofcourse for the flavour & texture. However you will need to use a combination of boiled rice (which looks almost like arborio rice) and raw rice (you may use Basmati rice). In India, sometimes instead of the combination of these two types of rice (boiled rice + raw rice) we use a single type of rice called Parboiled rice which I am not sure will be available in Indian/Asian speciality stores, do give it a try though. Good luck! Thanks for replying back. Maybe I'll give it a try when I find the ingredients. Again thank you! Just made sannas,and they turned out awesome!Thanks for sharing the recipe. Hi, i am new to your blog. I tried out your sannas recipe last week and it came out perfect, just the way it looks in your pics :)!! I have always been wanting to make sannas all my life but to no success. I just stumbled upon your website and thought let me try, since your instructions to prepare were very clear cut and looked easy. I am so happy that I finally got the right recipe for making soft and tasty sannas! Thank you!! @Karen: Thanks so much!! It feels so good to know that the Sannas turned out fine! Do let me know if you've tried some more recipes and how you liked them! @Unknown: Thank you soo much!! I am humbled by your compliments! Well, if you don't have regular sanna ramekins u can try the idly cooker, but the result won't be the same, so do try and get them on your next trip to India! I live in Brazil and here Urad/moong dhal or for the matter-of-fact any other type of dhal is not available. Thank you for this recipe…I am surely going to try it any my kids are going to love it. Thanks for the tips about the vessel, Shireen! Btw, I am Poornima. Thanks for your comment Poornima! Hope you like the Sanna! I tried this recipe without the urad dal, it came out really good. It was great having a reply from you SHireen, made me so much more connected to India. Thanks so much for your feedback Veena! So good to know that the Sanna came out good even without the urad dal! It feels great to be connected to you too – the internet is truly a terrific invention! Hi Shireen I am going to try sannas tomorrow. Just wanted to know if the grinding is possible in a mixie. I dont have a wet grinder. What is the consistency I should look for? Hi Ashwini, yes, grinding is possible in a mixie, I do the same too. Use the jar that has a blade meant for grinding rice (the one that looks like a fan), it will be the bigger jar of your mixie. You need to grind the batter fine like dosa batter, however retain the water from the mixie (when you have removed the batter & added water to wash it) and add it to the batter…it should be wee bit thinner than dosa batter but not runny. have a doubt if want to make these sannas early in d morning then can i let the batter to ferment for whole night. First time trying my hand on this. Please help. Also would the soaking time vary. Thanks. If the weather is not too warm (like Mlore) you may leave it to ferment overnight, as I know a lot of people who do that. Also, the quality/brand of yeast used will determine how fast your batter will ferment. Since I use DCL brand of yeast it ferments in no time and I've had a case of batter going sour when I left it overnight – which is why if I intend to make the sannas for breakfast I usually steam them the previous evening, refrigerate and then lightly steam (not microwave!) them again in the morning – they turn out super soft and fluffy! Thanks for the reply dear. I am in mumbai i have bright star brand yeast. I think i will make it in the evening and steam it next day. Hope it turns out well. Also does the rice and lentils need to be soaked only for 3 hours or can be soaked longer too. Shireen i love all ur recipes. I dont know if u remember me but i have commented earlier too on raw plantain curry (star moon). I recomended ur site to my sis who is in dubai and she was very happy. She just loved the way u pen down even minute things. She made kori curry and was happy with the result. Dev bhoren karu tuka. Hi! Thank you for sharing your sanna recipe. You have mentioned that for a heigher yield take a ratio of 3:1 (cups of boiled rice : raw rice)- I would be grateful if you could let me know if the quantity of yeast also should be increased. Thank you. @ Anonymous:Yes, you can increase the yeast to little less than double.ie 1-3/4th tsp will do (again it depends on the power of your yeast – so use good quality yeast) All the best! Hi shireen..found you blog while searching for sweet pulv. Your blog is just amazing. Being a mangie myself im so delighted t see all the recips u have mentioned. They all took me back home as I live in the uae. Just a question, as I want t try the sannas this weekend, can a mix of idli rice and basmati rice be used for the given ratio of boiled and raw rice? Hi Cynthia: Since I am not from Chennai I googled and found that a lot of baking equipment and other crockery is available at reasonable prices in Poppat Jamaal's, Mount Road/Anna Salai Road, Bang Opp Spencers. My friend from Chennai says u can check in Adyar Murugan Store and ask for idli kinna or katoris. I hope this helps. Hey Shireen. Thanks for your work on this blog. I just made the sorpatel per your recipe (blood and all) and it is delicious. One quick question here if you will indulge me. You mention ukdo tandul and raw surai. I am assuming that the ukdo tandul should also be raw ie uncooked. Is that true or should it be cooked? Thanks again for your recipes. Reminds me of the good times I had back home growing up. Hey Shireen, thanks for your work on this blog. I have a question of you will indulge me. The ukdo tandul is also raw ie uncooked, right? Hi Gopal, thanks for your compliment. Yes Ukdo tandul is pre boiled – right after harvesting – boiled in large drums of water and then dried in the sun – this process causes the rice grains to fluff up a bit. The confusion between raw rice, boiled rice & cooked rice lies in the terms. Raw rice is a variety of rice – where the rice is harvested, husked & sold in the market. Boiled rice is like I mentioned pre boiled, dried & sold. Cooked rice is a method of preparing the raw or boiled rice 😀 I hope this clarifies. I have added a picture of the Ukdo tandul for your reference! Cheers! @ Gopal, I am from Urwa and I miss Mangalore too! Hence the food – it helps me stay connected to my roots. Thanks a lot for blogging. Hi naveen , can u plz share ur proportions of toddy for the above recipe . Would really appreciate it.Thanks in advance. Hi Navin! Thanks a ton 🙂 good to know u r from Urva too!! Happy Easter & I am glad you liked the sanna! Hi Shireen, I have soaked the rice and daal, but when you say do not stir the batter, I am confused. Are you trying to say that after grinding and adding yeast, stir, but once fermented, do not stir! So wouldn't the batter be thick at the top? Also should the batter consistency be like the usual idli batter? The batter would have doubled – for fluffy Sannas do not stir the batter or it will go flat. Hope this answers your doubts. Pls feel free to revert if you have more doubts! Thanks for such wonderful information as how to prepare Sannas. Is it possible to avoid Sugar ? Does this taste like IDLI ? Are Sannas & Idli are same ? Can sugar be avoided ? Is it a substitute to Idli ? Thanks for the appreciation & so glad to know that you enjoyed the Sanna! By the way my name's Shireen and not Ruchik! What does ruchik randhap mean if thats not your name. My question was what if i tried adding yeast to my regular idli dosa batter, other than the quick fermentation, does the taste change? If you see the tag line on my banner, 'Ruchik Randhap' is a term in Konkani that means 'Delicious Cooking'. This is hilarious because my name is Sanna LOL. Hi shireen, every recipe that I have tried from ruchik randhap has always turned very good . THANKYOU so much for this website. It has helped me a lot . I feel sad to say I failed in only one and I am sure I made a mistake but donno where, so, I need ur help. I ground the rice for sanna and urad like u said. Added yeast. The batter rose but I think I did not wait till it doubled. The sanna where flat and mushy. Does the batter have to double? I used parboiled rice and instead of surai(which I did not have), I used basmati. Can u help me on this. Does it have to be steamed only 15-20minutes, since it did not rise, I steamed longer but to no help. I need help with this, so sorry. And have a wonderful NEW YEAR!! @ Sanna Madan: That's funny! You have such a cute name though 🙂 Hope you tried these sannas! 1. Did you grind the rice and urad dal separately? This is important as the urad when ground separately fluffs up nicely. 3. 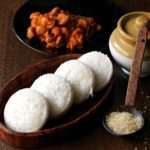 Parboiled rice is partially boiled rice also known as idli rice. It is used in recipes which call for a combination of boiled rice+raw rice. However in my recipe I have asked for a combination of two types instead of parboiled. I am not sure if its the right substitute you have used. Since I have never used it for Sanna I cannot tell you for sure that the rice is to be blamed. 4. Steaming is done for 18-20 mins but if the problem lies in the batter not doubling up then little can be done to save the sanna later. Sorry for the delay in responding, If you have more queries please feel free to comment here or email me at ruchikrandhap@gmail.com. Thanks! Shireen, Thanks for the reply, I am going to try them out again, This time I will let the dough double and I will change the rice. Will let you know how it turns out. Today I just finished preparing "egg roce curry" . Turned out Yummm…. This recipe really takes little time and is delicious. Thanks again. got a 10 on 10 for sanna and kori gassi from my mother in law. all credit to you. thanks a lot. tried them for the first time in my life. very happy. @ Ven: Thanks once again for the feedback on the egg roce curry 🙂 glad u liked it! Thanks a ton for this recipe….I am a telugu-ite but I spent two whole years in Mangalore – and fell hopelessly in love with the cuisine! I remember the steaming hot Sanas served with chicken curry for functions…amazing!! And the fish curries from restaurants, the chicken sukka, and trips to Ideal ice cream- where u get the yummiest ice-cream ever!! Sanas taste nothing like Idlis and should not even be compared to Idlis, they are a million times better!! @ Me: Thanks so much for youyr wonderful comment, so happy to know that you love Mangalorean cuisine as much as you love the other things about Mangalore. It is one of the best places to be! Yes, Sannas are a class apart! Fluffy goodness that is great to mop up any curry and satisfy your soul 🙂 Happy to hear from you! Dear Shireen, I stumbled upon your blog and must say your recipe for sannas sounds really good. Will try it out soon. I'm a malayalee btw and love idlis and sannas equally. In your blog and replies to viewers, idlis are underrated as less soft and spongy. Not true. 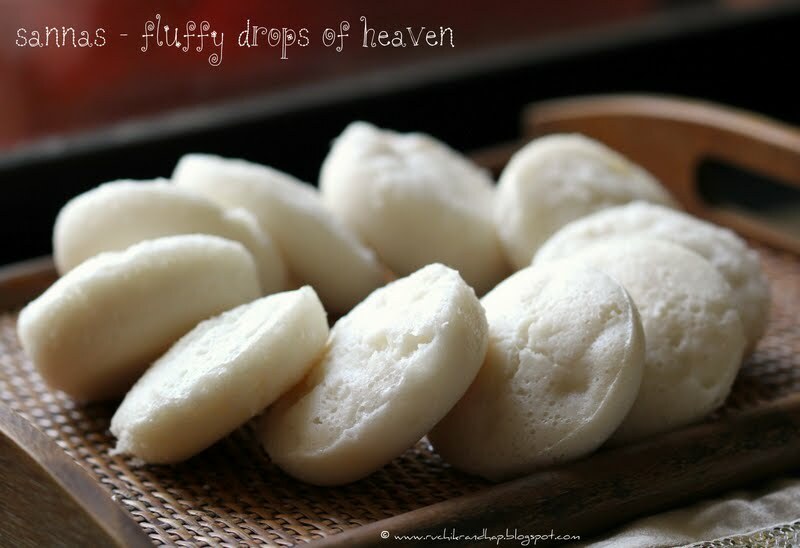 I have always made super soft, fluffy and spongy idlis. The trick is knowing what rice to use and how to make them I guess. Will let you know how my sannas turn out. I plan to use Goa rice that's available here in Mumbai where I live. Also known as idli rice. Super for appams too. Thanks for your lovely compliment! Well, I have always eaten idlis at restaurants and those have always been less soft and spongy than sannas, so my views are solely governed by my experience. I am sure there are various ways of making them and they will turn out great when the right type of rice is used, please do share your recipe and I will definitely give it a try. My email id is ruchikrandhap@gmail.com. Thanks and hope you enjoy the Sanna! Thank you for your prompt reply. Here's my surefire recipe for idlis. Mix boiled rice and idli rice, wash well and soak overnight. Add the methi seeds. Wash and soak the udad an hour before you begin the grinding process. Wash and add the beaten rice to the deal just five mins before grinding as it gets mushy quickly. I use an Ultra Tabletop wet grinder with a bowl of one and a half litre capacity. Grind the udad adding a little water off and on. In twenty to twenty five mins the dal should be ground well. It will appear light and fluffy. Remove it to a big vessel which will allow it enough space to rise. Next, grind the rice taking care to add enough water so the grinder stone moves smoothly but do not make it a very loose batter. It should be fairly thick or the idlis will sink when cooked. Grind the rice till the consistency is like fine semolina. I find the idlis turn out fine even if the rice is ground smooth. This way I use it both for idlis and dosas or utthappams. Hi Renuka, Thanks a ton for your lovely recipe, I will definitely give it a try! By measure do you mean cup? Pls let me know, thanks! If I replace the yeast with Toddy…What should the quantity be? There have been references made to par-boiled rice. Uncle Ben's is par-boiled rice. Also in the U.K. or U.S.A. use the yellow pages or do a google search for Indian stores or Chinese store or Vietnamese stores between them you should be able to get whatever rare to you ingredients you need. Do not feel bashful about asking the store cashier or whoever is working there for help in finding the ingredients you may need. @ Roona: I have never tried this recipe with toddy so I am not sure! I'm quite excited to try out your sanna recipe..some how haven't perfected it as yet. Can you pls let me know how many grams would one cup be? Is this "cup" available as a standard measure. Also, I have the TN idle rice that's available..so should I put 1&1/2 cup of TN idle rice & 1/2 cup of raw rice? I have always made sannas, but with your recipe they turned really awesome!! thanks for all the small tips.. including not stirring the batter – I always did that and it resulted in them not being that fluffy.. Suppose I do not want to make the sannas immediately can I keep the batter in the fridge and make them the next day morning ? Nothing like freshly made sannas!!! As I wrote earlier, you have a fantastic blog! One question about the sanna recipe, if you do not stir the batter after fermentation, wont the denser rice flour settle at the bottom and the top will be mostly urad, so that although the initial batch of sannas turn out soft and fluffy, the latter batches turn out a little hard? I have a similar recipe for making 'poles' or thick yeast fermented dosas and this is my experience, so I usually stir the batter gently, so that most of the foamy texture remains and later I had a couple of teaspoons of sugar so that the yeast can feed on the sugar and produce more carbon dioxide gas which gives the foam. I do the same for appams and I have always gotten really soft poles and appams. I have not tried sannas so I will give this recipe a try. @ Marina: Thanks so much for writing in. Well, I have never stirred the batter and it has always given me best results. Yes, the last 2-3 sannas get unfluffy batter as by the time you finish scooping out the rest of the batter a little 'flat' batter remains at the botton. I always felt that the act of stirring the batter after it has beautifully risen defeats the whole purpose of getting it to rise in the first place. I visit your blog very often. Tried a few of them as well. This time am looking for Sanna recipe. For the yeast, Can I also use Instant yeast (which I believe is different from active dry yeast). Will I have to follow the same procedure of dissolving in water & sugar. What about the quantity, will it be same? Thanks, and keep posting more recipes. Where do you get Belthige Akki from and what brand do you buy? I live here in the states too and I've been looking everywhere to find it- but I've been unsuccessful. Can you please tell me how to make soft sannas with mutamo rice. @ Lydia: I have not yet tried making sannas with mutambo rice. I will surely give it a try and let you know! @ Edward Lobo: The molds I have for sanna should be around 180ml. You could look for steel katoris, the bigger ones. Thank you for sharing your lovely memories with me! Yes, the aroma of sanna batter fermenting away brings back lots of memories for me too! Regarding your query, I have personally never used toddy to ferment the batter so I am not sure what proportions would be okay. I can check with someone back home and revert as soon as possible! Do stay tuned! Thanks so much shireen ! Sounds good ! Hope to hear frim you soon . Hi, how many Sanna does your recipe make? This recipe makes between 25-27 medium sized sanna! Hi Shireen, Tried out your sannas n they turned out soft n spongy. I used red rice from Mangalore n they were tasty. I steamed them in cupcakes silicon mould n got some beautiful shapes. But the only problem was there were cracks on top of some sannas? What could be the reason. Can u explain pls so I can rectify the mistake. Thanks. Shireen, love all your recipes but the sannas were the best… I just wanted to check again if I can store the batter in the fridge and make sannas the next day after the batter comes back to room temperature? Does the yeast still work after a day? Thanks so much for your feedback on the sanna! So glad you liked them 🙂 Well, yes, once the batter has fermented you can refrigerate it. Do remember that it will continue to ferment in the fridge and may spill over so it is better to place a large plate underneath to collect the overflow. The next day you need to bring the batter back to room temperature before steaming the sanna, so yes, a few hours on the counter should help. The yeast will still help the next day! Thank you so much Shireen. Wanted to have the Sanna-Dukramaas tradition at Christmas. Attempted the sannas finally this Christmas after 4 years in the US. I had to experiment with different kinds of containers at home, since I didn’t have the traditional ones. The batter was perfect and the texture of the sannas was soft and fluffy. We enjoyed it with dukramaas and chicken curry. Thank you.